Note – you can do most of this with other note-taking services such as OneNote, but (in my opinion) Evernote wins out with its huge platform compatibility – particularly with the mobile apps; and with the many integrated third party apps available across platforms also. And it’s free. For the sake of productivity, we want to be more efficient with the time and resources we have, to enable us to spend more time doing what we want – in this case, writing. Evernote allows me to do a lot of side-line work while out and about, and to keep everything together in the one place, accessible anywhere. Although it’s possible to use Evernote as a text editor and the apps have wordcount and some decent rich text formatting functions, Evernote doesn’t contain the structure many writers require in pulling scenes, chapters or text portions into a logical order – notes are captured chronologically, or can be filtered by title etc, but you can’t pull them into order. There are much more proficient writing editors out there, my favourite being Scrivener. 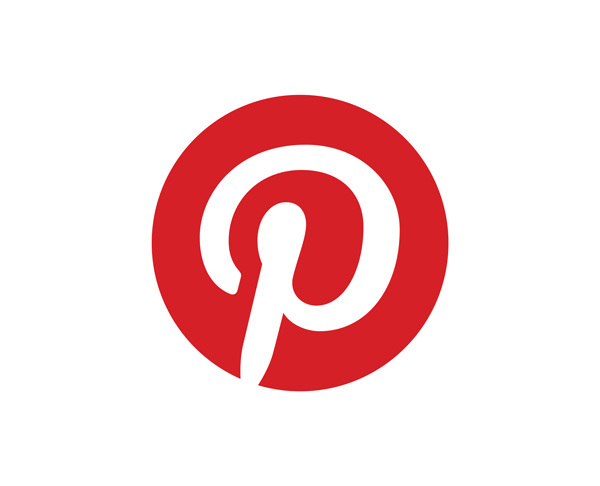 But – if you’re after a very quick way to post publically from your Evernote text notes, Evernote integrates into a couple of specific blogging platforms the most popular being postach.io. 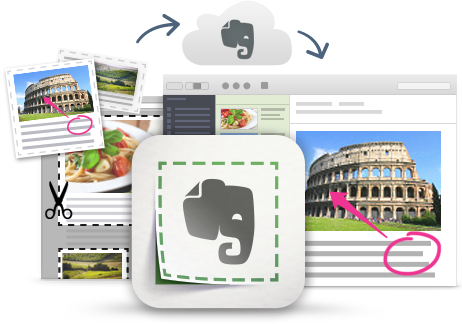 There are several manageble Evernote – Blogging workflows also. Do a quick search to find several. (There is also the opposite workflow – your published blog posts can easily be sent into Evernote using the blog’s RSS feed and IFTTT service – great for archiving your posts). And if you have created (or captured) a masterpiece, Evernote has some good sharing options to allow you to make your note public on the web, share with collaborators (premium users) and send out public links to friends via social networks etc. This is what Evernote was made for. Capture, keep and access all your research notes and ideas and general inspiration through Evernote, for always. Once your webclippings, typed notes, oral notes, photographic notes, app-driven notes, emails (forwarded into Evernote), and RSS blog feeds or saved for later notes (Feedly and Pocket both offer send to Evernote options) are up there in the Evernote cloud, you can access them everywhere you have access via the internet, and for Premium users, access them via mobile while off-line. As they are automatically synchronised, your notes are almost instantly available on PC, tablets, or your phone. Webclippings are my most often-used access point into Evernote. For each writing project, I create a research notebook, and store everything I find relevant into that notebook. Current projects are also taken offline (as a Premium user) on mobile devices, so that I can consult them when I am out and about. Evernote is supported by the EN Webclipper extensions for all browsers (free), plus Evernote Clearly (free) is a browser plugin which takes any page you are browsing and clears it up from sidebars, headers and adverts, leaving you solely with the web article (which you can then clip to your EN database for permanent forever access). Mobile devices are also supported with EN Webclipper apps, and bookmarklets. My favourite clipping app is Everclip. We all as writers have had epiphanies or ideas hit us in the head when we’re not sitting at our desks. In fact, walking and domestic chore times have been found to be the best triggers for creative ideas and problem solving. And many times these ephiphanies happen when a notebook or pen just isn’t on-hand (or while driving, where writing in a notebook is not even legal). As most of us have mobile devices and smart phones, the answer for us sits with Evernote again. The EN mobile apps have audial recording functions as a new note input. Simply open Evernote, and hit the microphone button to start recording your new idea or inspiration as a new note. (If you’re driving, use hands-free options and personal assistance from apps like Siri). Audial notes are also quite good for early morning ideas that waken you. Rather than putting a light on, and grasping blurry-eyed for a notebook (which can wake a partner also), mobile devices come with inbuilt screen-lights, and you can hold them close enough to quickly whisper out your idea while recording it. Premium users have access to larger audio note uploads, so this tip also works well for when attending writing workshops, lectures or courses – you can record the speakers. (Some countries also have access to transcription services which will take those Evernote recorded notes and transcribe into text notes also). Mobile Evernote apps also contain some specific camera options – there is a document camera, post-it note camera, business-card camera and a normal camera option. Use these cameras within Evernote (or the normal phone camera) to take photographs of any inspiration you find while traveling or away from home. Photograph buildings or areas as new settings, or capture other focal points (posters, people, transport, anything) which provide inspiration or ideas. Images will appear inline inside a note, and the largest image in any note will also be used by Evernote as thumbnails and gallery images for notes inside your notebooks. The EN Business-Card camera identifies the edges of cards, updates contact information,and also integrates and pulls-in information from LinkedIn. Great for writers with a lot of networking contacts, or for writing conferences or meet-ups. General image notes are also good for writing workshops or lectures – if anything is written onto a whiteboard or larger posters, simply take a photograph for memory. If you read writing magazines or writing craft books, use the cameras to preserve interesting crafting ideas. (I also use Evernote to keep recipes from food magazines). Evernote has optical character recognition on images (and for Premium users, on PDFs). Once OCR has been run through the images, you will be able to find that note again using searches based on the text content within the image (within reason). Another good usecase for this option is to capture your own larger written or hand-drawn documents. Many writers like to plan out books or larger works with either index cards or post-its, perhaps on the floor, or as a big wall chart. This full outline can be photographed, and kept for posterity and securely. Following on from Point 6, the OCR technology in Evernote, combined with the mobile cameras, means that you can digitalise and keep forever important notes in written form. The document camera in Evernote apps is designed to find the edges of rectangular document pages – this is perfect for your writing notebooks or journal pages. These images, once captured into a note within EN, will have OCR passed through them, and for good hand-writing may even allow you to search for text content within the image and find those notes. I would put keywords onto the digital note also, to allow search to work more quickly. Evernote and Moleskine have a special Evernote Moleskine journal also, which comes with special colour-coded sticky labels allowing you instant organisation (similar to the Post-its below). But any journal can be digitalised this way including sketching notebooks etc. The post-it camera is designed to capture square post-it notes, but not only that – Evernote and 3M have designed a colour-coding use of this – you can nominate what green might mean, once it is sent through to Evernote. So, you may choose yellow notes to mean “new idea”and pink ones to mean “to do”. They will then be filed into appropriate Evernote notebooks for easy-find. Make use of the full Evernote cloud space for storage. PDF documents and other office documents can be attached into notes (Windows PC users have in-line PDFs which can be read and paged through via a PDF app inside the note onscreen). As a Premium user I make full use of this, and store all my PDFs and other document types inside Evernote notes. If I want to read larger PDFs when out-and-about I also download that notebook into my tablet EN app, and can read the full document off-line, via a PDF browser inside of Evernote. I use this method for putting together full workshop course materials I may have taken. Also, fundamentally, this is a good way to backup your important writing documents such as drafts and full manuscripts. Pull the document file into an Evernote note, and you’re safe. If it’s a PDF, you can also take it out and about, perhaps for reading a draft and making editing notes etc. Word documents and the like will open with clicks into the relevant applications on your desktop. Android mobile users of Evernote also have integration with Office Suite Pro. Note – some paperless-office practioners also scan in all their documents, receipts etc – there are special scanners with Evernote integration, mobile scanner apps work well – anything that creates PDFs from scanned documents with email facilities will work. (Some countries also have access to services which will do the scanning and input to Evernote for you). You can also automate the document uploads via import folders. See the bonus tip below. Images (and for Premium users, PDF’s) can be annotated within Evernote using the inbuilt Skitch functions. (Skitch is also available as a free app). Label, annotate and mark out important areas. Note – this is one method for editing draft documents, provided you export your document as a PDF and attach into an EN note. But there are more proficient PDF annotation apps out there, and in my opinion, trying to edit any larger draft using any kind of app is still quite cumbersome. You may have noticed many Skitch/EN annotated images appearing in PDF workshop documents if you’ve taken any recently. And if you intend providing courses yourself, or perhaps for promotional material for your writing, consider the tools available to label your images and screenshots. Bonus Tip: if you’re a heavy graphics user, not only can you annotate via skitch on images inside of Evernote, but you can setup the program connection for double-click. When I double-click an image inline to an Evernote note, it opens in my graphics editor, where I can make changes, apply filters etc. Then when I save, the changed images appear back in the Evernote note. Evernote notes have a checklist function. Use it for important lists and structuring your ideas. You can search for un-checked checkboxes also, to find what remains to be done. Notes can also have reminders set on them. You can simply set a reminder, or set a date, with popup or email notifications. A note with a reminder also appears at the top of the notebook list, allowing you to see it quickly. 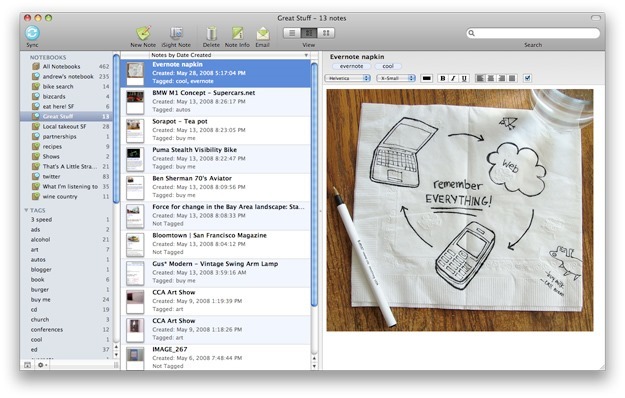 There are several calendar and to-do apps which integrate or can use Evernote’s reminder notes. My new favourite is the free and wonderful Sunrise Calendar app for Android and iOS – not only does Sunrise bring in your Google calendars, but also shows Evernote reminders within the calendar – and these can pop into your email inbox on the day of the event or reminder. Other apps such as GNEO supply other functions alongside EN reminders also. I use checklists for structural or planning notes for my writing, and reminders obviously for important target dates. 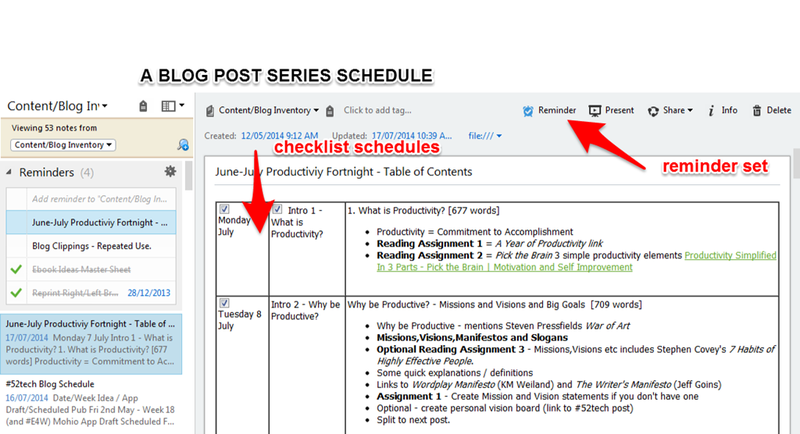 Checklists and Reminders are particularly helpful with running a blog schedule of posts and to-do’s, as I do, using a note with an index table and checkboxes. But both functions are very valuable for other life areas such as travel or other planning, allowing you to be more efficient with your time overall. There are some great overall writing programs available (I’ve mentioned Scrivener is my choice) which offer features specifically for writers (such as conversion to ebook formats, structural formats, and of course – a lot of text editing functions). But most don’t offer cloud storage or full cross-platform compatibility. So, you generally can’t take your writing out onto mobile devices, or are forced to juggle multiple copies and synchronisation and movement of files through cloud storage and apps like Dropbox. Evernote does not replace your text editor and project management system, but offers a one-stop shop for all the documents, web-clippings and graphic formats of any plans, logs and drafts manuscripts you do produce. My own planning sessions can take place across multiple apps, for instance. I currently use mindmapping tech, hand-drawn notes, a few journal notes, index card apps, free-form graphic and text-based apps, webclippings for research, and many more. Once into writing projects, I keep some important research files within reach within my Scrivener project notebooks, but I can’t keep everything there. I also like to log progress – whether wordcount, or thoughts of the writing day. Provided the media documents can be exported as graphic files (JPGS or PNGs), as PDFs, or digitalised (via EN mobile cameras), or in some way sent to Evernote, I can have all of those files kept as notes onhand in an EN project notebook. In fact, for larger projects I work with Project “stacks” – a stack is a folder where other EN notebooks are stored – so I’ll have a project stack and a few sub-notebooks, one for research, one for planning notes, another for progress logs and random ideas. It depends. The example screenshot above shows my current work focus project stack with some research notes and some planning notes. (mmm, and about that news that the next Thor will be female…they just lost me as an audience). To get the most from Evernote, it pays to keep the structure within quite tight. To start off – keep tags to a minimum. You can quickly grow huge amounts of tags within Evernote, and some apps make you try to guess at what tags you’ve previously used, resulting in several permutations of the same general tag. *Inbox – this is the default notebook (you can set this to another name within settings). This is where I primarily send all my new note data – webclippings, app-driven “send to Evernote” notes, forwarded emails, automated deliveries (I use a web service IFTTT to deliver my own newly published blog posts straight into Evernote so that I can archive them), RSS blog feeds etc. (I don’t send all my blog feeds into Evernote, just the ones I want to keep permanently after reading them through my blog reader, Feedly, or via Pocket app, which lets me read them offline). Once into the inbox, I have a daily task of zero’ing out that EN Inbox. I typically file notes into relevant notebooks, or stick them into the to do notebook for further action. * To Do’s – these are my current to-do’s. If I’m working on a larger writing project, like writing the series on productivity, I will dump all my reading material, ideas, and an index note and planning notes into here. Once each has been progressed, they will be filed elsewhere or deleted. Typically this notebook is where the checklist and reminder notes are sitting. Project Stacks – I have several different project stacks, relevant to current projects at hand. Once a project is complete, it’s sent to an archive stack. Projects for me are mostly writing projects – I keep one for blogging also. Some are started, then go onto a backburner while I focus on one. Most like that sit in a “Projects Stack”with individual notebooks for each project. The current project I am focussed on gets its own stack and a couple of notebooks, which are also opened up for offline use on my tablet. I keep a stack for courses I take also. Active courses have notes going into an active course notebook. These contain PDF tutorials and my own work on homework etc. They are then archived once completed. But as an artist I also have an “art” stack where there are also tutorials, ideas and gallery notebooks for inspiration. Those notebooks are shared with my daughter completely – she can add to them also via her own Evernote account. reference 2 is for stuff to help my daily life – tips and material on technical stuff mainly. I also have a Writing Craft stack with many sub-notebooks, and similarly, a Writing Career and Business stack with several sub-notebooks (including a “productivity tips” one). And I also have a home/domestic reference stack – it keeps manuals and warrantees for our whitegoods, maps and other things like a note to remind me what type of lightbulbs I need to buy for certain lights in the house. And there’s a large Recipes stack with notebooks for various meals, shared and collaborated on with other chefs in the family. If you hold a writer’s website or blog, it’s easy to automate your blog archival – using IFTTT (If This Then That), a free web service, you can set up a recipe taking any blog posts newly published into Evernote. Create your own recipe or borrow the many from others. Subscribed to lots of writerly newsletters? If the information inside is worth keeping, forward the emails straight into Evernote. 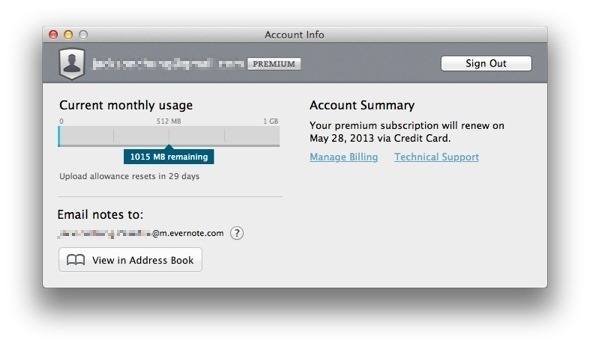 Simply forward to your private Evernote email address, which you’ll find in your account info. Use that private email address and set it up as a contact. When you’re on your mobile device and in an app which allows for send via emails (most do) then send to your Evernote email address. Once you have the folder or folders setup, any time you drag and drop or save a new file into that folder, Evernote will import it as a note into your inbox or default notebook. And yes, you can use a Dropbox folder (or shared folder) as an Evernote import folder too. This means that if you use Dropbox for sharing or moving files across platform devices (like I do from my iPAD) once you’ve added the file into that folder, and Dropbox has synchronised across to your PC, Evernote will find it. In October last year I released a PDF freebie to newsletter subscribers – Top 10 Power User Hacks – Writers using Evernote. The document contains many of the same tips as above, with image examples, but also a few tips not mentioned in this post. Download the free PDF via this direct link: Top 10 Power User Hacks for Writers. #Evernote4Writers: This post formed part of an ongoing series to blog a book, “Evernote for Writers”. The posts from this series, offering a guide to using Evernote as a writer, can be found under the tag: E4W, #Evernote4Writers,or #E4W. An index will be provided from the top menu. If you do not have Evernote yet, click on this button or link – not only will you be able to download Evernote (which remains free forever) but you’ll have access to try out the premium features for a month.